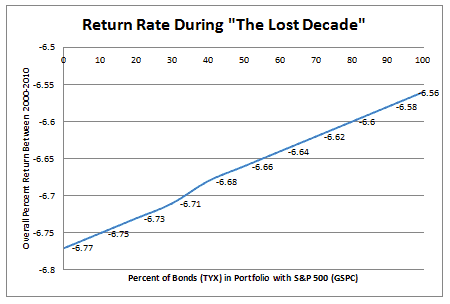 Would Dollar Cost Averaging and Bonds Have Saved You From “The Lost Decade”? In the first part of this series, I wanted to test the claim that dollar cost averaging (DCA) was an effective strategy for protecting your investments. Too often I’ve heard claims against investing within the media saying that if you had bought stocks (particularly) during “The Lost Decade” between 2000 and 2010, then you would have had a -23% return on your money. After crunching the numbers, we determined that dollar cost averaging would have beat a static investment in the S&P 500 and returned a -6.8% return instead of a -23%. That’s great, but who wants a negative return?! Why didn’t we just hide our money under the mattress and do nothing? Unfortunately, that may be true. But remember that when it comes to investing: Defense is just as important as offense. So even though we lost money, the point of our experiment was to see if dollar cost averaging would have helped protect our retirement money during the bad times (also called hedging). Therefore, in this second part of the series, we’re going to add something new to the mix to further hedge our portfolios: Bonds. That’s right; we’re going to re-run the same dollar cost averaging example as before only this time adding a mixture of bonds to the equation. How do think we’ll do? Bonds have been called everything from boring to beautiful. Fundamentally, they are different than stocks in that they are a repayment of debt with a guaranteed rate of interest. By contrast, when you own a stock, the value of your investment is only as good as what the market will pay you. • 110 – Your Age = The percentage of your portfolio that should consist of stocks. The rest should consist of bonds. 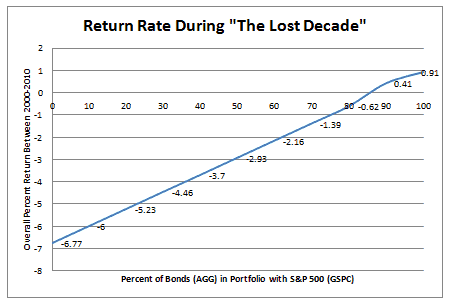 With that said, what was the magic ratio of bonds to stocks that produced the greatest return during the Lost Decade? So using the same dollar cost averaging formula as Part 1 (keeping it simple by ignoring inflation and dividend returns), we now gave ourselves an option to invest a portion of our money in “iShares Barclays Aggregate Bond (AGG)” corporate bond index as well as the S&P 500 stock index. As you can see, the more bonds we added to the mix, the better our performance became. Actually, our best return rate, +0.9%, came when we had no stocks at all! But Wait! What If We Had Used Treasury Bonds Instead? So does this suggest that we should only invest in bonds and not have any stocks at all? Nope, and here is the contradiction. Ouch! 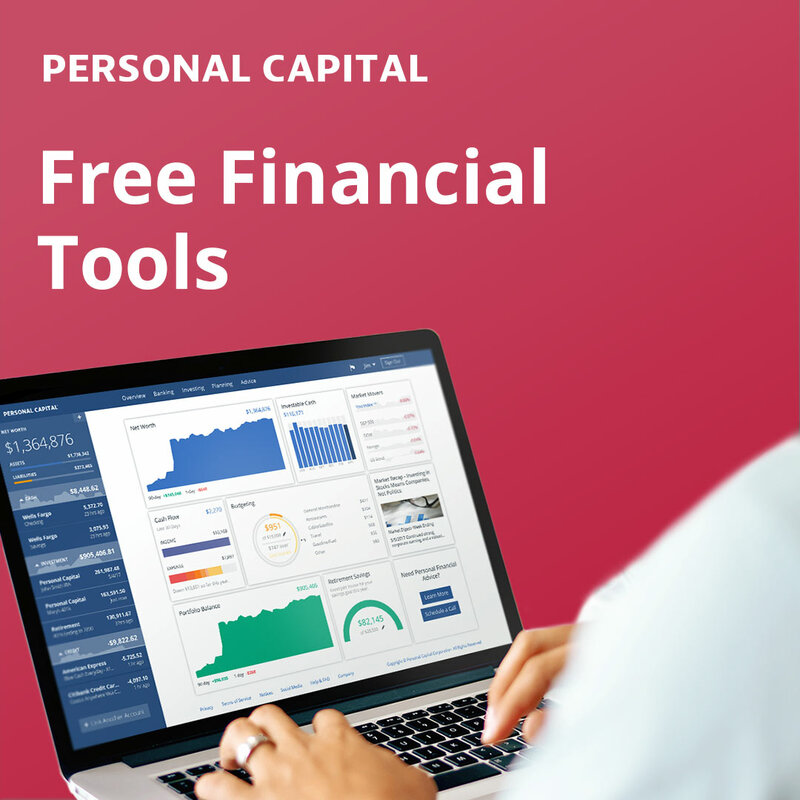 The portfolio only improved from -6.77% to -6.56%. Therefore, investing in good-ole safe government bonds did nothing to protect our investments! • In general, bonds can be a useful part of our investment strategy. But like everything else, choosing the right fund makes all the difference. • Not all bonds would have improved our level of protection. As you can see, investing in the corporate bond index versus investing in the treasury bonds gave us very different results. • It’s easy to look backwards on data like this and say what we should or should not have done. But does this mean that the future will hold the same results? I think not. Recall that the time between 2000-2010 was considered one of the worst economic periods of modern times. Hopefully the years to come will not be this hard on our portfolios. • As I pointed out in Part 1, remember that these results are unique to only this 10 year period between 2000-2010 and could easily yield other results if we had chose a different 10-year time frame. • We need to be diversified beyond just simple paper assets like stock and bonds. 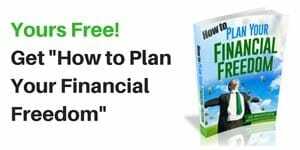 Even if another Great Recession occurs, would it be possible for you to still draw income from owning our own business? From side work? From owning gold and silver? From rental property? From dividend stocks? From selling things over the Internet? 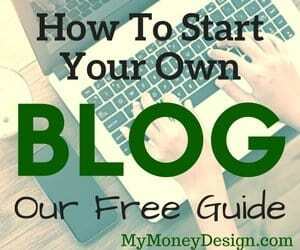 From owning a blog? Remember there is always more than one way to get rich! 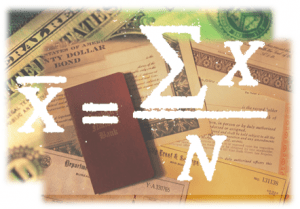 Readers: What is your exposure to bonds and stocks? Do you believe in dollar cost averaging? What strategy do you use for spreading your investment risk? 2) Is 2 Percent the New Safe Retirement Withdrawal Rate? Would Dollar Cost Averaging Have Saved You From “The Lost Decade”? Is It Time to Change Up My Retirement Portfolio? I’m a big believer in dollar cost averaging. The two biggest mistakes investors make are (1) getting out of the market completely and (2) stopping contributions until ‘the waters settle’ (not dollar cost averaging). I’ve personally managed portfolios for awhile and if you dollar cost averaged from 2008 until 2010 you would have made all of you money back (plus some) even though the DOW was still around 10k-11k back then. Of course this depends on your portfolio and stock/bond mix. I’m also a believer in diversification. Any time you’re 100% invested in any one thing (stocks only) then I think you’re not properly diversified. I’m currently in a 85/15 portfolio and will scale that more towards the bonds over time. Thanks for the input! Definitely I see a lot of people making the big mistake of stopping their retirement contributions during the bad times. This is completely the inverse of the buy low, sell high mentality. I am also a big believer in diversification, but my definition of diversification is starting to grow beyond stocks and bonds. Good points! Another interesting exercise, and maybe this was done, is to account for rebalancing from bonds to/from stocks. If DCA helped the cause over the lost decade, so would have taking the proceeds from bonds and reallocating to equities or vice versa. That is a very valuable observation! I did not consider that scenario in this example. But you have given me a great idea for a follow-up post! I agree with you. I invest every month in ETF’s. no matter market is up or down I invest fixed sum of money every month. and I am getting good returns so far. Someday I’m moving into ETF’s! I’ve still got some research to do into them. But all the same, good job staying disciplined with your strategy. The one thing you did point out is that you would have lost less. My portfolio of stocks tend to be less volatile that the market. I do not loss as much in downturns as the market losses. I think I do better because it seems that less volatility means better longer term gains. Of course, the other side of this is that my portfolio does not gain as much in the market upturns neither. I’d actually be fine with a portfolio that offered more defense and less return. At some point you care more about holding onto your money than you do about trying to make double-digit returns.